September kicked off with the much anticipated arrival of Amanda Smiles, founder of Ruraq Maki and jewelry making instructor. This was her 5th year teaching jewelry making techniques with wire and beads. She taught 4 morning classes to the Club de Artesanas (CdA) women and 4 afternoon classes to the CdA teens. There was an afternoon class with homework for the 2 CdA trainers, and a class in Huancarani. The techniques have gotten more complex each year, and Amanda donated 2 jewelry making books to the PAZA library that contain all the techniques that she has taught in a variety of new designs. 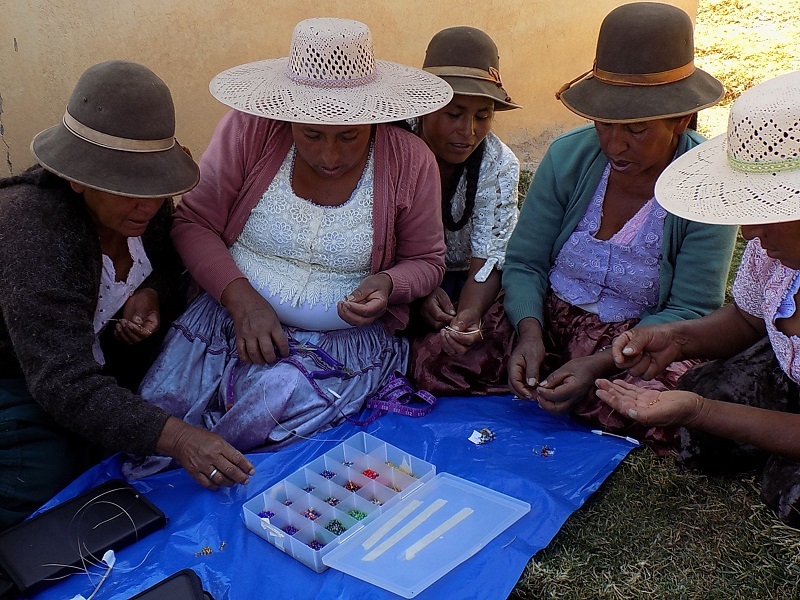 The class for the CdA trainers was added this year to teach them how to plan and prepare for the jewelry making days to be held once a month. They need to learn to monitor the projects so the supplies are used responsibly and the students use the techniques in designs that improve their skills. If any of the CdA participants decide to make jewelry to sell they will be able to buy the supplies through PAZA to get started. 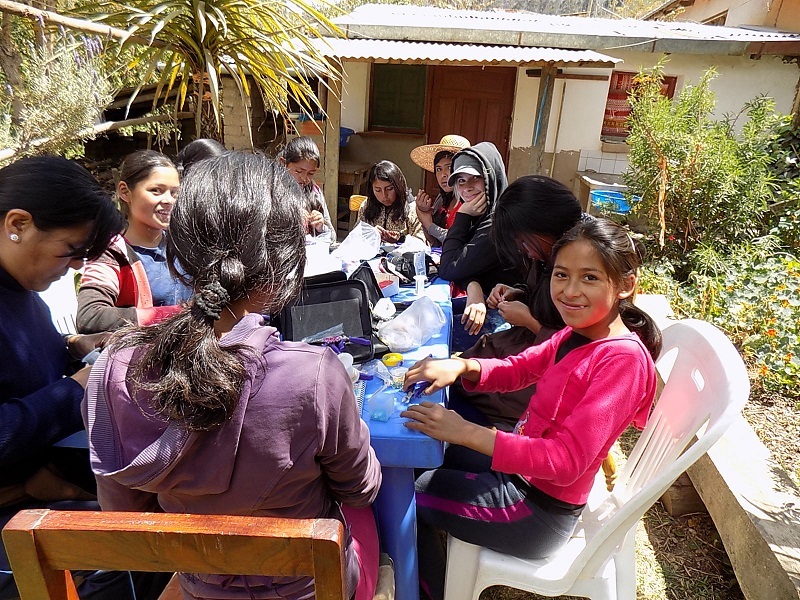 There was a great turnout for the jewelry making class in Huancarani. 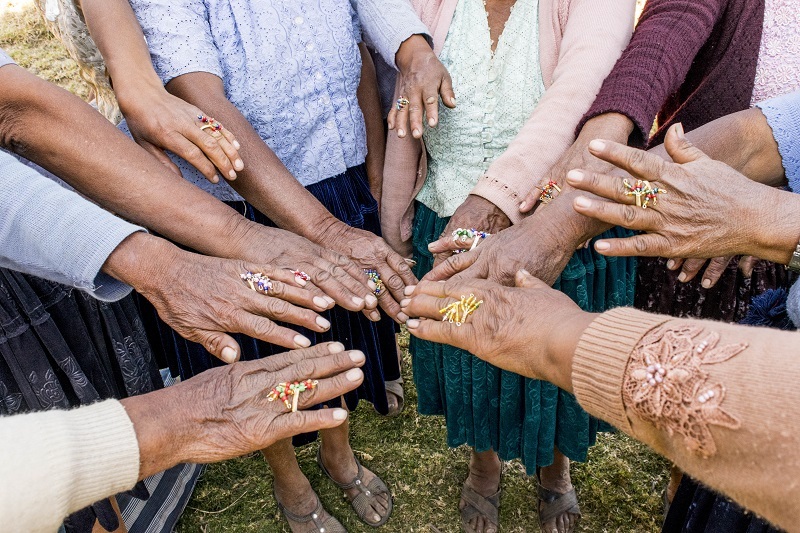 Eighteen out of the 28 members of the Centro de Artesania, Huancarani (CAH) crowded around plastic sheeting in the shade of the church to make rings. 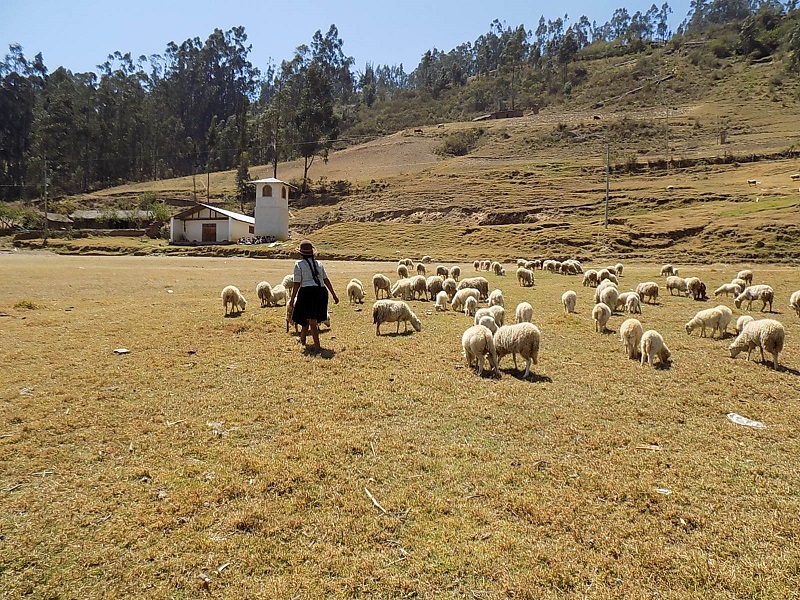 Three women had to bring their flocks of sheep so the hillside and soccer field were full. Doña Antonia Calcina’s flock was ornery and she took off running multiple times as they edged towards the downhill slope towards home. After the class there was a brief Spinzilla Spinning Week meeting. Sixteen spinners on the Cloth Roads Warmis Phushkadoras Spinzilla team live in Huancarani and 3 more are from Huancarani but live in Independencia. 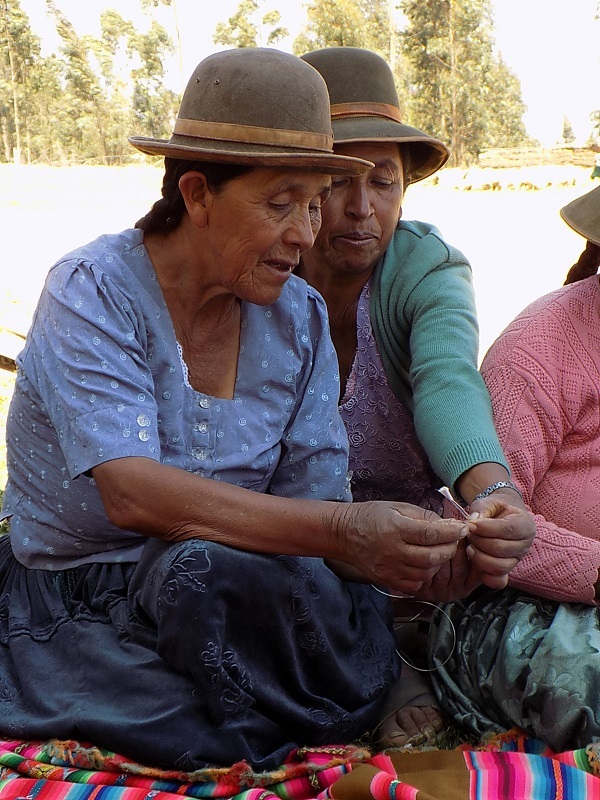 Many of the women were spinning or plying as Doña Máxima, the Team Captain, went over the rules and reminded everyone to start preparing roving. The rural women learned to spin as girls and it is odd to see them without a phuska (drop spindle) in hand. 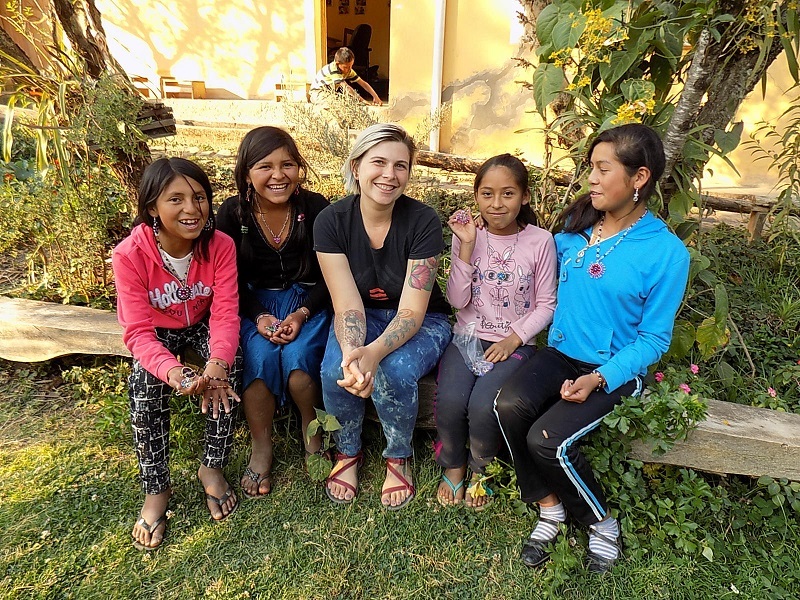 The women and teens all send a hug and thanks to Amanda for the long trip to Independencia lugging the jewelry making supplies. It was 2 fun weeks that all look forward to every year. Many of her students commented on the ease of working this year thanks to the 10 sets of jewelry making pliers that had been donated by Ruraq Maki. A huge thank you to Spinzilla Team Coordinator Constance Hall and to Marilyn Murphy the Cloth Roads sponsor for the team for once again getting the word out to rally support for the Warmis Phuskadoras. The budget of $1,000 for the event has been met. Thank you Debora Petschek and Alison Walsh for your support, all want you to come back soon to visit! Those of you who supported the team last year and again this year helped to convey to the spinners that their skill is recognized and valued. Thank you Margaret Tyler, Sarah Linder, Susan Brady, Katrina Stewart, Victoria Huff, Judy Gilchrist, Penelope Brakenbury, Linda Ligon, and Shani Kari. It has been fun hearing from new friends who are supporting the spinners this year. Your comments will be shared with the spinners during Spinning Week.Thank you Peggy McKoy, Jayne Schafer, Dana Davidoff, Janet Davis, Jeanette Lurier, Anne Bluemel, and Katherine Spitler. 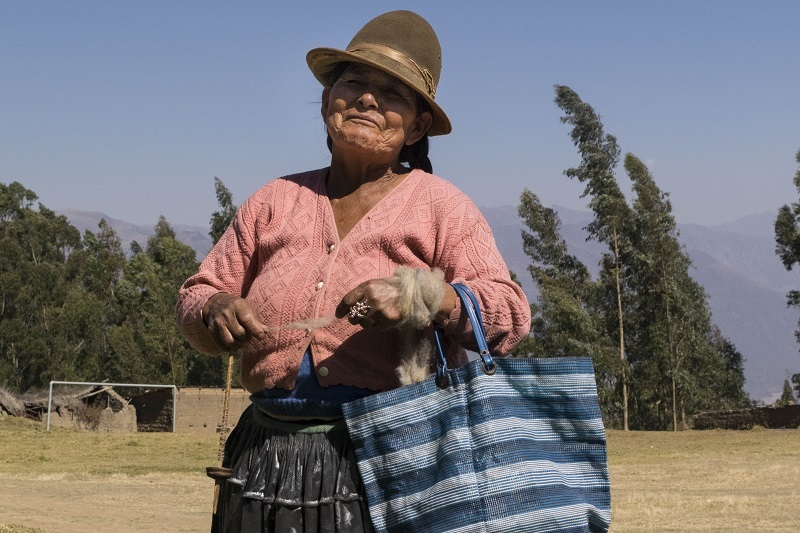 All the heartfelt comments and support demonstrate to the rural Bolivian women that there is a bigger world of spinners sharing the camaraderie and joy of Spinning Week. A thank you is due to WARP member Jere Thompson for being proactive in getting the word out for 2 volunteers during Spinning Week. The spinners really do want to see a foreigner spin and had asked that a foreigner join the team. There were some inquires, so maybe next year… Thank you, Kate Larson, for writing the great article about the Bolivian spinners for the, “Spin Off” blog.